Dr Walid el Abed, Founder & CEO The digital era, although promising simplicity, has brought forth challenges in the way business operations are executed and managed. Organizations have to contend with the complexity of the rules of globalization and the magnitude of data to be processed to achieve operational optimization. 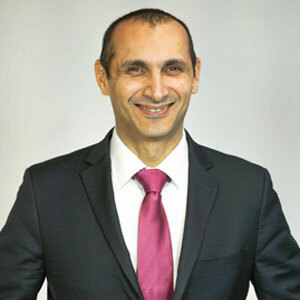 Dr Walid el Abed, founder and CEO of Global Data Excellence (GDE), an international expert in linguistics and computer science, realized the inability of traditional tools, manual collaboration and human intelligence to help businesses with the changing business rules, objectives, and knowledge. He foresaw the need for a system capable of answering the vital questions that organizations have to solve in order to perform their mission in the best way. Dr el Abed, who has a Ph.D. in Artificial Intelligence, created “The Data Excellence Science,” a new science that makes it possible to optimize the interactions between humans and computers, thus enabling operational excellence and governance by value. In an effort to reduce business complexities, GDE harnesses its decade-long experience with artificial intelligence (AI) to bring computing power and human resource onto a platform—the Data Excellence Management System (DEMS). Challenging the new wave of data explosion and changing business regulations, GDE was founded based on Dr el Abed’s vision of data as a strategic asset and data management as a top priority for every organization. With new regulations being imposed on businesses globally, companies struggle to remodify their information, behavior, and procedures according to the latest norms. In order to ensure the correct implementation of regulations, organizations perform compliance verification through internal and external audits. Although this process is considered standard, it has lost its effectiveness due to increasing business complexities, rapid internal and external growth, acquisitions, and time constraints. GDE responds to this dilemma head-on—leveraging its homegrown ‘Data Excellence Management System’ (DEMS)—by teaching the new compliance rules to the organization’s internal systems and connecting to disparate data sources without moving or mining the data. GDE’s AI then analyses the organizational data and systems to generate upfront reports on the expected deviation and its potential impact on the organizational values, both economic and human. GDE’s system automation capabilities accelerate the execution of new rules according to the organization’s glossary and language, all without altering the current infrastructure. DEMS is a complete integrated cloud-based system that uses contextual intelligence based on artificial intelligence techniques and semantics. It provides a factual value-driven collaboration that engages end users from all levels in the ultimate value creation. Moreover, DEMS helps organizations to manage data quality policies and rules, to comply with EU GDPR guidelines or any other regulation like FINMA, but also to continue to adjust as interpretation will continue to evolve. DEMS’s leading-edge is in its ability to transform a law into rules and human natural language into machine code for humans and machines to understand. GDE’s clients can define an objective like GDPR excellence, apply the required threshold, specify the desired target, and then define the GDPR rules. “DEMS does not manage knowledge; it generates it out of the predefined rules,” explains el Abed. Following the knowledge generation, semantics is autogenerated which in turn creates the program that bridges the gap between the human definitions of rules and the program that will be executed on the database. When a rule is changed or modified, the system identifies all the links, the traceability, and the impact of the rules, and auto adjusts the full ecosystem to this new rule. DEMS is made up of three components: 1) a contextual business glossary in natural language systematically linked to 2) the AI-generated catalog of the enterprise information system, and 3) the DEMS agent. DEMS generates the map of the enterprise catalog and enables clients to govern it. The business glossary contains these mantics which is linked to the catalog. The DEMS agent will be close to the source from which the program will be generated automatically using the semantic metamodel embedded in DEMS. The DEMS agent contains a generated program that questions the data source and gives the answer back to DEMS—shaping it as an end-to-end value governance solution. Along with automation and dynamicity, DEMS, by default, is not only multi lingual at the UI level, but also understands rules, policies and data in five languages—Arabic, French, English, German, and Russian. Because of its strong semantic basis, it can also fully learn any language within only two days. Embedded into DEMS, the Data Excellence Framework (DEF) is based on Data Excellence Science—the science of governance, business excellence, and analytics. To maximize the business value of enterprise data, the DEF governance framework includes the organization, its processes, and the roles and responsibilities of the community. DEF acts as a common organizational framework for governing the required business values which enables a sustainable collaboration, in turn producing a synergy by ensuring data excellence at every level of an organization by proposing the best organizational model for a data driven enterprise. DEF’s special methodology maximizes the performance of the platform and guarantees the success of this innovative approach, providing a 360 degree dynamic view of value creation while allowing an iterative, learning, and evolutive roadmap towards excellence. GDE’s latest ‘Data Excellence Science’ educational framework offers certification programs through collaborations with various universities and academies to train and educate people towards a smoother transition into the digital era. Unlike competitors that require data lakes and warehouses for data integration, GDE allows its clients to manage data at source using DEMS’ brain and DEMS’ singular AI patented technology—the polarizer. Leveraging AI in its DNA, DEMS automatically customizes itself for each context according to user values, the roles and objectives of the user, the rules of the function, and the relevant data. “By defining the objectives, economic values, policies, and rules, DEMS automatically creates a cohesive, perfectible and value-driven universe out of these parameters,” explains Dr el Abed. DEMS caters to governments, such as the Canton and Republic of Geneva, or the Ministry of Justice and Security of the Netherlands, as they need to govern the economy of the country and provide services to their citizens. GDE also caters to standard businesses such as Michelin, Firmenich, Bacardi, BNP Paribas, Groupe Mutuel Assurance and confidentially to some of the greatest names in the financial industry, helping them move from the old ERP era governing according processes and financials only, to the 4.0 digital enterprise dealing with a more complex world. The next generation of DEMS will involve all aspects of data, community, and business rules. The data aspect will include the ‘data sharing sphere,’ which will enable cross-organizational data sharing. “Raising above the GAFA and the traditional social networks such as Linkedin and Facebook, DEMS will enable a value-driven and purpose-driven, social network for enterprises to foster Symbiocratic collaboration across the full ecosystem,” says Dr el Abed. Mr. Gambardella, the director of the Fongit, the Canton of Geneva’s main institution for promoting and supporting innovative entrepreneurs, confirms “Fongit is proud to be a partner of GDE and to contribute to this outstanding innovative project from Prof. el Abed which gives visibility and prestige to Geneva and the entire Swiss economy.” “With such support GDE DEMS is set to be the European Unicorn out of Switzerland fostering the creation of a new society of excellence governed by value,” concludes Dr Walid el Abed.